Boiled liver with ginger and garlic. Rice with carrot and natto on the side. I’m just impressed that he is keeping his bib on. EM rips his off in 2 seconds now. I am very impressed with his eating variety. I’m getting hungry just reading the description! @MJD-S: We have old-fashioned tie-in-the-back bibs for that very reason! @ Mum He loves to feed himself with his fingers. But we did manage to steal some from him to taste and it was yummy. Taking food from a baby indeed!! @ MJD-S he gets bored of siting in the high chair with the bib on in about 35 seconds and wants to pull it off. We then run around the lounge room attacking him with the spoon as he likes to eat on the run. He does the cutest thing though when he has finished eating - he puts his hands together and bows with a “gochisou-sama deshita” Plus he has the sign for “oishii” down. @ Felix he loves liver, fish and natto. He also loves to paint his face and hair with food. 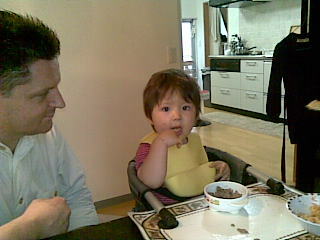 That is why he only gets natto before bath-time as he is big natto face baby when it is natto on the menu.